The feminine is as essential to the world as oxygen or gravity. It is women who give life and women who nurture it. Each of us has a part of the divine feminine within us, but for many of us this has become suppressed, silenced or forgotten. 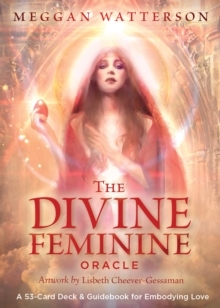 This Divine Feminine Oracle Deck is an invitation to reconnect with the sacred feminine that exists within us. This beautiful deck contains 53 cards with representations of divine women from myths, religions and history. Each card is accompanied by a message that reveals the aspect of the feminine you need to integrate and embody more fully in your life. This deck is for all women seeking healing, empowerment and transformation.